This group of high-flying tech stocks has crushed the market in recent years. Will the good times continue? The FANG stocks -- the popular acronym encompassing Facebook, Amazon.com, Netflix, and Google parent Alphabet -- were all the rage for a few years, as the fast-growing tech companies were among the market's best performers. The name even spawned variants like FAANG, which included Apple (NASDAQ:AAPL), or FAAMNG, which brought in Apple and Microsoft (NASDAQ:MSFT). Combined, the FANG group has a market cap of around $2.3 trillion, and with Apple and Microsoft, it tops $4 trillion. Data as of March 15, 2019. Source: S&P Global Market Intelligence. Below, we'll examine the current prospects for the FANG stocks, but first, let's review some history and see how these stocks got to where they are today. The term "FANG" was coined in February 2013 by Jim Cramer, host of CNBC's Mad Money, and his colleague Bob Lang. They endorsed the group of stocks, predicting that they would outperform the market. Cramer argued that all four companies represented the future, dominated their markets, and had serious momentum. 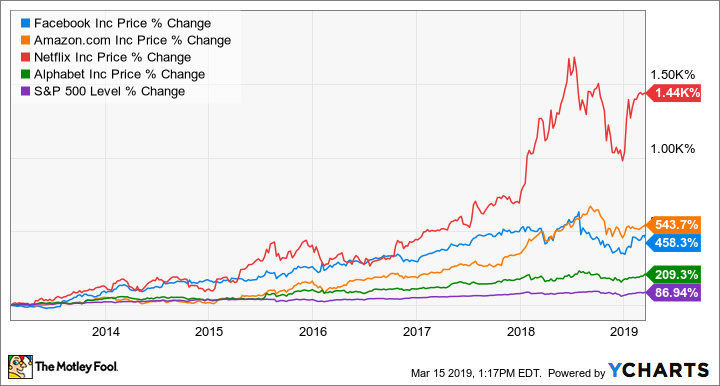 All four of the stocks have benefited from rapidly growing revenue and profits, as well as a 10-year bull market that's been kind to growth stocks. However, while these companies have several similar characteristics and compete in some of the same industries, they are not peers in the strict sense of the word -- their businesses are different from one another, and they are all subject to different sets of risks and market forces. FANG, after all, is just a convenient acronym. There is nothing significant binding these stocks or their performances together -- though their massive size has begun to catch the attention of regulators concerned about antitrust issues. U.S. Senator and presidential candidate Elizabeth Warren has even discussed breaking up Facebook, Amazon, and Alphabet. Facebook and Instagram continued to grow their user bases, fending off a potential threat from Snap's (NYSE:SNAP) Snapchat, in part by copying Snapchat's Stories, a key distinguishing feature of the app. Today, Facebook has more than 2 billion monthly active users (MAU); Instagram has more than 1 billion MAU, and the advertising business has grown exponentially along with the user base. Facebook's massive operating margins -- the percentage of revenue it keeps after operating costs like salaries and data centers -- reached 50% in 2017, and its rapid revenue growth, with a 47% jump in 2017, made it a market darling. However, the story shifted in 2018 as the company experienced a number of scandals and felt a backlash from both users and investors. First, investigations into Russian interference in the 2016 U.S. presidential election raised questions about Facebook's involvement. Then, in March of 2018, the stock crashed on revelations that Cambridge Analytica had misused Facebook data to target voters and manipulate the election. The news prompted a "Delete Facebook" campaign, but the stock rebounded with the help of a strong earnings report. But after peaking in July, the stock fell off a cliff on its second-quarter earnings report when management signaled that margins would narrow while it added employees and invested in technology to protect user privacy and make the platform safer and less vulnerable to politically motivated hacking and abuse. Today, Facebook is at a crossroads. The stock is as cheap as it's ever been, with a price-to-earnings ratio around 22, but its brand has been damaged, and it seems unlikely that the company will return to its former high growth rates. Amazon's stock languished through 2014; the company actually reported a loss for the year, as well as slowing revenue growth. Shares fell 22% that year. However, Amazon put those concerns to rest once it broke out its results from its cloud-computing division, Amazon Web Services (AWS), for the first time in its first-quarter earnings report in 2015. By doing so, Amazon took the lid off of its biggest profit-growth driver, revealing 49% revenue growth in the division and an operating margin near 20%. The stock jumped 14% on the news. From that point, Amazon stock caught fire. Its share price more than doubled in 2015, and it recently stood as the biggest company in the world by market cap, topping $1 trillion at one point in 2018. In 2017, AWS was Amazon's most profitable segment and actually delivered a majority of the company's profits from operations (in part because Amazon's international e-commerce division still operates at a loss). AWS revenue jumped 43% in 2017 to $17.5 billion, which translated into operating income of $4.3 billion, or an operating margin of 25%, and that rapid growth continued into 2018. However, AWS is far from the only significant change at Amazon over the past five years. Amazon's 2017 acquisition of Whole Foods made it a major player in groceries and pumped up its annual revenue by about $15 billion. Amazon has added value to Whole Foods by offering discounts to Prime members and home delivery through Prime Now. It's also planning to add new Whole Foods locations to expand its delivery reach. But Amazon's biggest shift in recent years has been the company's increasing focus on its bottom line rather than the historical emphasis on revenue growth to build for the long term. Having already blanketed the country with warehouses and attracted more than 100 million members to its Prime loyalty program, Amazon has built a formidable network of competitive advantages. It's also beginning to reap the benefits of the businesses that have grown out of those competitive advantages -- including its third-party marketplace, which delivers higher margins than direct online retail, and advertising, where revenue has more than doubled on a year-over-year basis. It's now the third-biggest digital advertiser after Google and Facebook. Consequently, Amazon's net income more than tripled in 2018. We expect the company to keep focusing on the bottom line, as annual revenue topped $200 billion in 2018, and it can only grow so fast at this point. Netflix has been the best performer of the FANG group since the beginning of 2013, jumping more than 1,000%. It's also the smallest of the group -- meaning more upside potential, especially six years ago -- and its performance in this time period benefited from a massive sell-off not long before. You may remember the Qwikster debacle of 2011, which prompted a subscriber exodus when the company split its streaming-video and DVD-by-mail services and doubled the price on subscribers. Since then, the stock has recovered and then some, and Netflix has continued to buck short-sellers and other bears, who argue that the company's strategy of burning billions of dollars in cash each year will ultimately lead to its demise. Netflix's subscriber base surged during that period as it completed its international expansion in 2016 and finished 2018 with 139 million paid subscribers around the world, triple the 46 million it had five years before. Despite that massive growth and its sudden takeover of the entertainment industry and culture, Netflix is still facing several challenges. While growth outside the U.S. remains strong, with 22 million international members added last year, domestic growth will likely slow soon, as more than half of U.S. broadband households have signed up for Netflix. That's part of the reason why Netflix just announced an 18% price increase for most of its U.S. subscribers, from $11 per month to $13 per month, as it needs to squeeze more profit out of its most mature customer base. 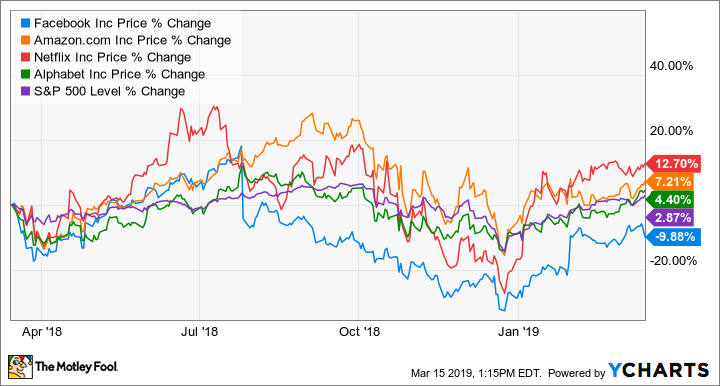 Netflix will have to take on more debt as it continues to burn through cash, which puts the company at risk as a wave of competitors -- including Walt Disney (NYSE:DIS), AT&T (NYSE:T), Comcast (NASDAQ:CMCSA), and Apple -- prepare to jump into the streaming pool. Of the four stocks in the FANG group, Alphabet -- formerly known as Google -- has been the worst performer. Its stock has "only" tripled since February 2013, though it has still beaten the S&P 500 by a wide margin. Not surprisingly, Alphabet has changed the least of the four companies: It's still heavily reliant on its search engine and makes the vast majority of its income from its related advertising business. The stock's best day in recent years came in July 2015, when the company posted a strong earnings report and new CFO Ruth Porat promised to hone its focus on its core businesses and allot a maximum of 10% of resources to experimental projects. Just weeks later, the stock climbed again as the company restructured and renamed itself Alphabet, separating core businesses like search, YouTube, and Android -- which it folded into the Google business -- from its experimental businesses, which it calls "other bets." Investors cheered because the move gave them more clarity and insight into the business -- and made it easier for Alphabet to sell or spin off one of its other bets if it so chose. Today, Waymo, its autonomous vehicle (AV) division, is the most valuable of those other bets, fetching an estimated valuation as high as $175 billion, according to Morgan Stanley. That figure is based on the $5 trillion opportunity in the global transportation market and Waymo's status as the widely recognized leader in AV tech. However, Waymo's current revenue is negligible, as it's still primarily testing its technology. Like Facebook, Alphabet's strength in advertising has made it both highly profitable and a growth juggernaut: Revenue jumped 23% in 2017 and posted an operating margin of 24%. Though its cost per click, or what it charges advertisers each time someone clicks on an ad, has consistently declined, the number of paid clicks is growing faster as Internet use increases globally. Since each FANG stock competes in a different industry, they all have different challenges ahead of them, as well as distinct strengths and weaknesses that will determine their fortunes this year. However, FANG stocks are often subject to the same set of market forces because they are all high-growth tech stocks that have been lumped together and rely on a certain optimism about the future. For instance, it wasn't surprising that FANG stocks fell faster and further than the broad market during the sell-off in the fourth quarter of 2018. Beyond that, though, the individual returns of FANG stocks this year will be determined more by their own results and actions than by the market's course. Facebook is the clearest example of this. The stock's path diverged sharply from the rest of the FANG group last year due to the series of scandals it faced and its indication that profit growth would slow while it makes investments to shore up its platform. Facebook's stock looks cheap today -- its P/E ratio of around 22 puts it on par with the S&P 500, even though the company is still growing much faster than the broader market. In other words, we can reasonably assume the risk from the scandals and backlash is already priced into the stock, making it a good candidate for a recovery this year. Although profit growth may slow in the near term, the company's investments should make it stronger over the long run, and since the market is forward looking, investors are likely to reward it for improvements in the brand and for solidifying its future. Therefore, Facebook has a low bar to overcome this year. Investors should also expect Amazon to keep plowing ahead into new industries. It's already signaled its plan to open new Whole Foods stores, expanding its reach into groceries. Meanwhile, the company is making a big push into shipping and home delivery, attempting to undercut the leading logistics companies, FedEx (NYSE:FDX) and UPS (NYSE:UPS), on pricing. Investors had long anticipated that Amazon would break into logistics in order to support demand for its own retail business. It can also build out a new business that it can then use to serve other customers, much in the way it did with AWS, which was originally created to support Amazon's e-commerce business. Similarly, Amazon could also make a big move into healthcare. The company has already acquired online pharmacy PillPack for $1 billion and started a joint venture with Berkshire Hathaway (NYSE:BRK-B) and JPMorgan Chase (NYSE:JPM) to disrupt the healthcare industry. With Amazon's history of delighting the customer, healthcare could be a good target for its next ambitious experiment. Netflix may be the most predictable of the group. The video streamer will continue to ramp up content spending, especially on originals, in order to grow and solidify its subscriber base before more competition comes in. The company already has nearly $20 billion in streaming content obligations, and that number is expected to grow. Analysts also see its content budget rising from $12 billion last year to $15 billion in 2019 on a cash basis, showing why it expects another year with negative $3 billion in free cash flow. Though Netflix has $3.8 billion in cash, it's likely to borrow again this year or by early 2020 as it burns through that sum. At Alphabet, investors should expect to see continued growth in advertising, and they will want to keep an eye on Google's other businesses, which include in-app purchases, Google Cloud, and hardware -- that category has been growing faster than the ad business. Google racked up $19.9 billion in "other" revenue in 2018, a 32.7% increase from 2017. Similarly, 2019 is expected to be a big year for Waymo. It just launched its first commercial autonomous ride-hailing service, Waymo One, though the pilot program is small for now, only serving several hundred customers in the Phoenix area who opted to join its Early Rider program. One question that's always on the mind of Alphabet investors is the company's plans to return capital to shareholders. Alphabet has stepped up buyback efforts lately, repurchasing $9 billion in stock in 2018, and it could accelerate those repurchases, since the stock is relatively cheap following the recent sell-off. The company has never paid a dividend, but demands for a payout may increase, as the company has already amassed $106 billion in cash and marketable securities on its balance sheet. Finally, investors should keep their eye on monopoly and antitrust concerns. Facebook and Amazon, in particular, have attracted negative attention. Facebook is seen by some as abusing privacy norms and, with its ownership of Instagram and WhatsApp, blocking out competition in social media. Amazon, on the other hand, continues to push full speed ahead into industries like supermarkets, but it could face regulatory pushback if it tries to make more acquisitions. The demise of the company's plan to put a new base of operations in New York City also shows that public sentiment on tech giants like Amazon may be changing. Still, that doesn't mean they'll be losers by any means. Facebook, Amazon, Netflix, and Alphabet have the strength and growth potential to continue to beat the market. If their stocks fall this year, the pricier FANGs like Amazon and Netflix could be vulnerable, but otherwise the future looks bright.